Collagen, as a major fibrous protein of connective tissue, provides a structural basis. Collagen molecules act as physiological matrix, during normal repair processes. Salvecoll® provides basic biological resources required for wound healing. 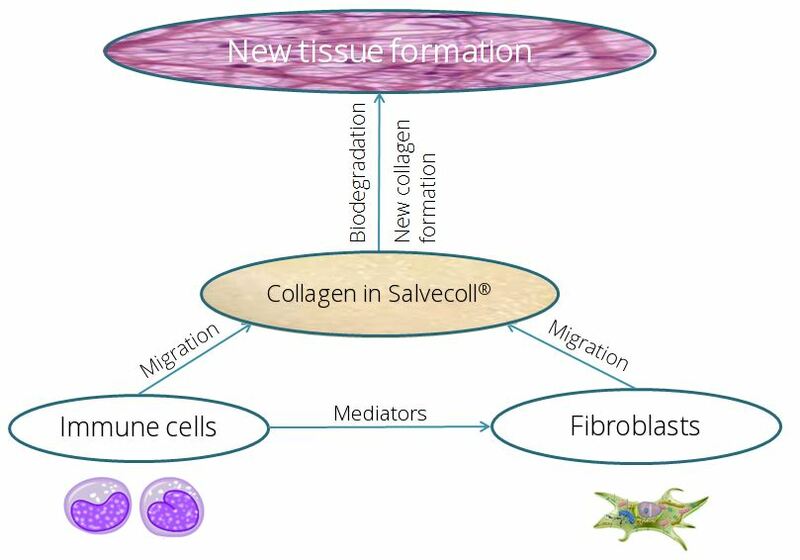 The collagen implant connects with the wound while fibroblasts migrate to it from the surrounding tissue and invade the implant. A transition matrix is created, which stimulates the immune system and the activation of granulocytes, macrophages, and fibroblasts, and improves the transfer of growth factors released from cells, enhancing fibroblast migration and proliferation of epithelial cells. When administered, the body produces new collagen fibers that fill the cavity in the area of implantation, while the implant itself is gradually absorbed and replaced by new skin. Salvecoll® accelerates the movement of osteoblasts on the collagen matrix, while increasing the thickness of the osteoid layer. Biodegradation of Salvecoll® gel depends on several factors, such as the area of ​​implantation, the patient’s age, the concentration of the gel, and takes on average 90 to 180 days.